Whenever we post a moped it usually polarises our readers. You either love it or hate it, and you never hold back – that’s why we love you guys. And when it comes to mopeds we don’t really know anything about them. To be honest, I didn’t even know what a batavus hs-50 was until I googled it. All I know about mopeds is that when I see one I like, it’s usually a stripped back piece of rolling art. 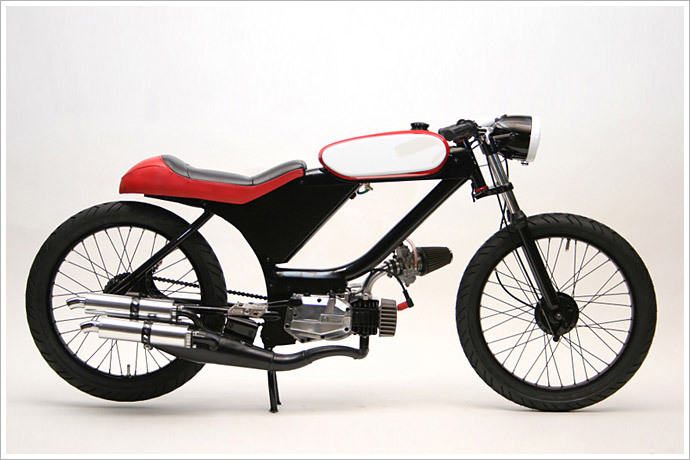 Like this stunning Batavus moped built by Nathan Kiehn and the guys at Motomatic. Their philosophy is pretty simple “we want to build bikes that have the nostalgia of the past, the power and performance of the present with a touch of reliability and style to them.” Sounds like a pretty good combination to me.